Lebala Camp is ideally situated in the huge Kwando Concession, renowned for its large elephant and buffalo population, plus lots of Lions, Hyena, Leopard and Cheetah and frequent visits from roaming packs of Wild Dogs. At Lebala Camp you only need to sit on your private wooden deck for a short while to see a variety of animals wander by. Lebala is intimate with 8 large tented rooms accommodating 16 people. Full en-suite bathrooms and spacious interiors make it very comfortable and each room has its own deck for relaxing. 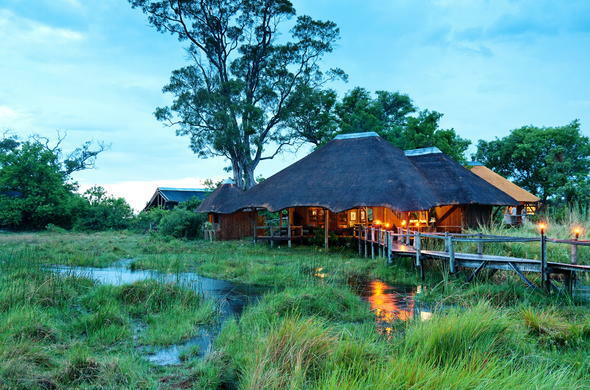 The rooms are widely spread out with a short stroll to the main lodge, so you are accompanied to and from your tent during the evening in case you encounter animals. This freedom from fences makes your African game experience all the more exciting. The main thatched lodge is airy and relaxed with home-cooked buffet meals and fully stocked bar included in the tariff. The lounge is full of informative books and the large plunge pool is most welcome in the heat of the day. Lebala Camp is in the heart of big game country and the open floodplains form the focus of the animal concentrations. The permanent Kwando River is full of Crocodiles and Hippos and sustains the animals in the dry season from May to October. The emphasis is very much on enjoying the animal experience and if there is something really special to see, dinner can wait! Lebala is small and friendly with 8 large tented rooms accommodating 16 people. Full en-suite bathrooms and spacious interiors make it very comfortable and each room has its own deck for relaxing. The main thatched lodge is relaxed with home-cooked buffet meals and fully stocked bar included in the tariff. The lounge is full of informative books and the large plunge pool is most welcome in the heat of the day.